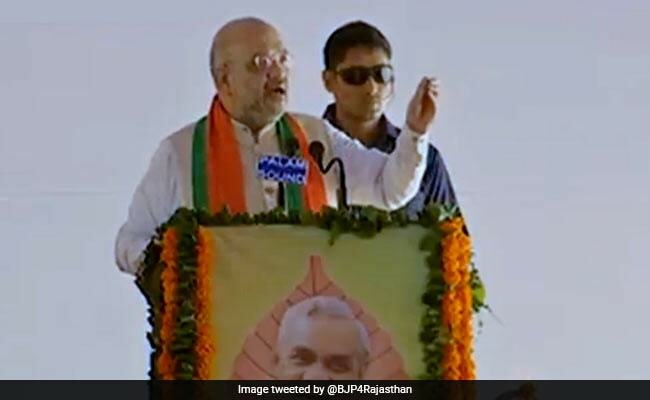 Amit Shah was on a visit to Jaipur today where he spoke to party workers. In a sharp take takedown of the Congress, BJP chief Amit Shah has dubbed it "Humpty Dumpty" after the nursery rhyme egghead. In Jaipur today on a stock-taking mission ahead of the coming assembly elections, he said the Congress has arrogance, a far cry from the leaders of the BJP. "These people of no consequence, who are like Humpty Dumpty, they have arrogance... our leaders have confidence in themselves," he said at a meeting with BJP workers. Yesterday, there was day-long sparring between the Congress and the BJP as 22 opposition parties backed a day-long country-wide shutdown over rising fuel prices and the sliding rupee. Prime Minister Narendra Modi had led the attack. Without naming any party, he said those who failed in government also failed in opposition. As for the Congress, "Nobody is prepared to accept its leadership. Even small parties are not willing to accept its leadership. Some treat it as a burden," the Prime Minister was quoted as saying by Union minister Ravi Shankar Prasad. Mr Shah had expressed confidence that the BJP will rule for the next 50 years - triggering a hitback by the Congress. Dubbing it "Mungerilal ke Haseen Sapne" - a reference to a famous TV serial in which the main character was always daydreaming -- Congress spokesperson Randeep Surjewala said India cannot become North Korea. Such claims, the Congress said, can only be made by those who do not believe in democracy and want to crush the Constitution and its values.